Our online catalog is PrairieCat. Let us walk you through using your account! Mouse over the “Catalog” link in the menu above to bring up the drop-down menu. For your Library Card Number, use the entire 14-digit barcode number located on the back of your library card. Your default PIN is the last 4 digits of your barcode, unless you changed it at some point (this can be done by editing your account on the PrairieCat website; if you need your PIN reset, call us: 815-883-3619). After you hit submit, you will be returned to the home page. To view your account, click on your name in the top, right-hand corner. You can see what you have checked out (and renew books if they have no holds for other patrons). 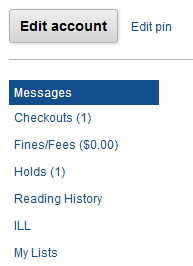 You can see any fines or fees (and pay online with a card). You can see details about your holds. To search for books, use the search bar located at the top of any page or in the center of the home page. Once you have found the item you would like to place a hold on, click the grey “Request it” button to the right of the item information. Select the library from which you would like to pick up your book in the next window that pops up. The logout button can be found in the upper right-hand corner where the login button was.